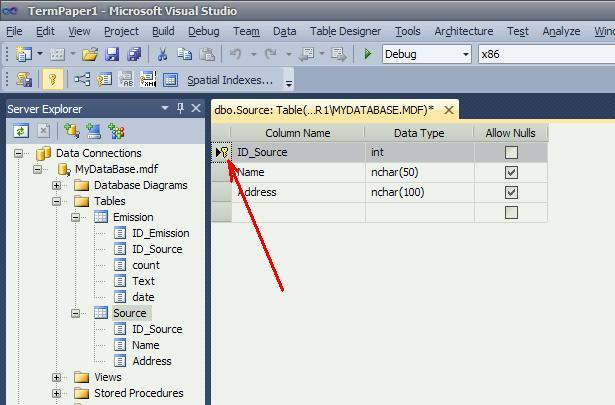 Creating an autoincrement field (counter) in the MS SQL Server database table, which is located in the “*.mdf” file. 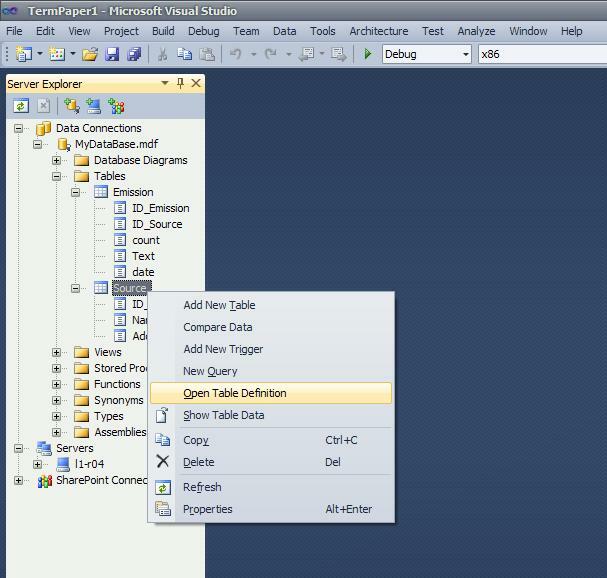 The Microsoft SQL Server database is given. The database is located in the files “MyDatabase.mdf” and “MyDatabase.ldf”. You can download the archive with the ready-made database files here. The database has two tables named Source and Emission. The Source table defines the source of polluted emissions. The Emission table defines the time of emissions and the number of polluted emissions that was generated by the source. The structure of the tables is as follows. 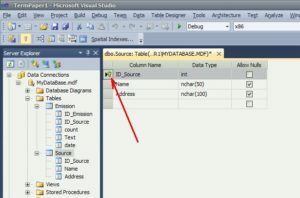 Using the tools of the Microsoft Visual Studio system, you need to implement a one-to-many relationship between the Source and Emission tables for the ID_Source field. Archive with files can be downloaded here. 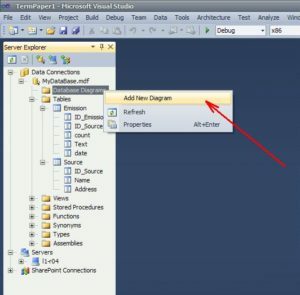 After connecting the Server Explorer window will look as shown in Figure 1. 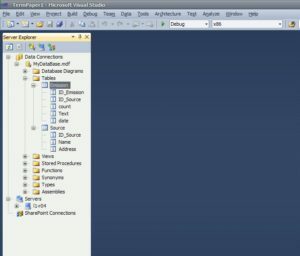 It should be noted that the ID_Source and ID_Emission fields are unique counters. Such fields are used in databases to ensure the uniqueness of each record of the table. 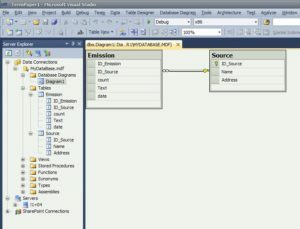 The ID_Source field of the Source table is the primary key. Creating an autoincrement field (counter) in the MS SQL Server database, which is located in the “*.mdf”-file. 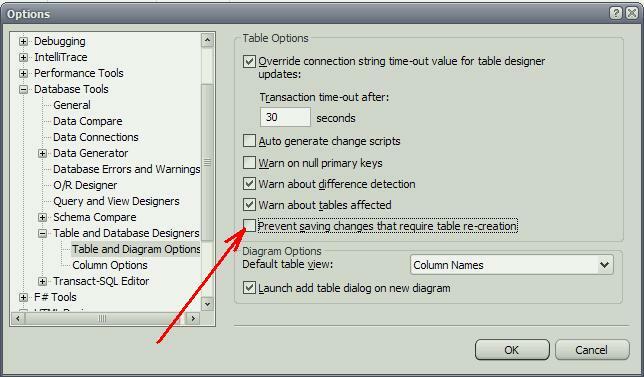 By default, MS Visual Studio system prevents saving changes that require re-create the tables. 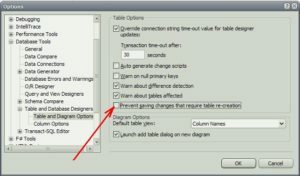 in the “Table Options” group, uncheck the option “Prevent saving changes that require table re-creation” (Figure 2) and confirm the selection (OK button). 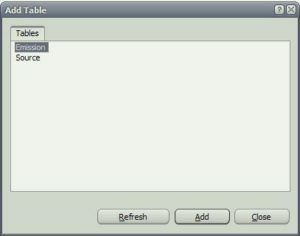 After completing the steps, you can create a relationship between the tables. As you can see from the tables structure (Figure 1), the ID_Source field is common to both tables. The connection between the tables will be carried out by this field. 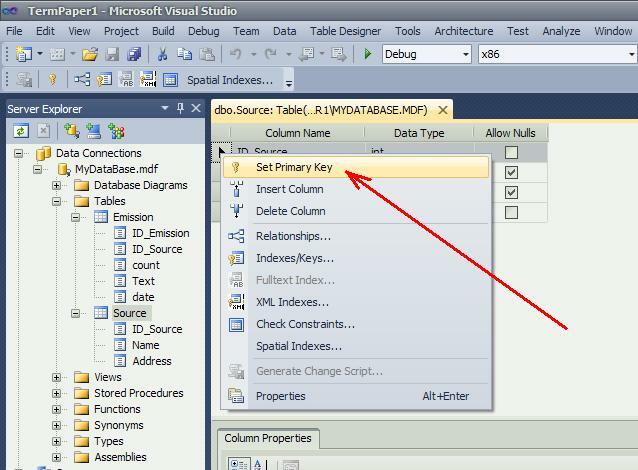 In the Source table, you need to set the ID_Source field as the “Primary Key”. save and close the Source table. 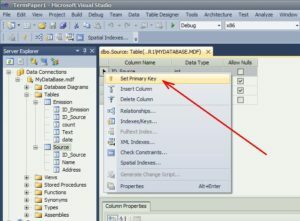 In the Emission table, it is not necessary to set the primary key. close the “Add Table” window. After the performed actions, the diagram window will have the form, as shown in Figure 8. So far, the tables have no connection with each other. 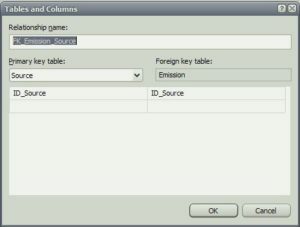 To start the relationship between the tables, you need to click on the ID_Source field of the Source table, and then (without releasing the mouse button) drag it to the Source field of the Emission table. 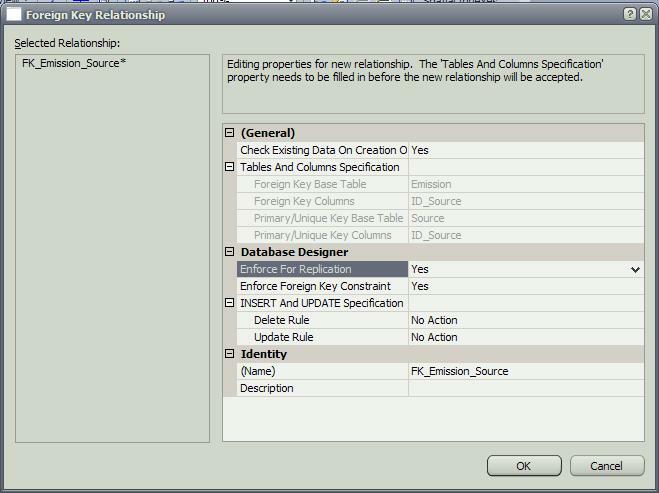 As a result, two windows will open in sequence: ‘Tables and Columns’ (Figure 9) and ‘Foreign Key Relationship’ (Figure 10), in which you need to leave everything as is and confirm your choice with the OK button. 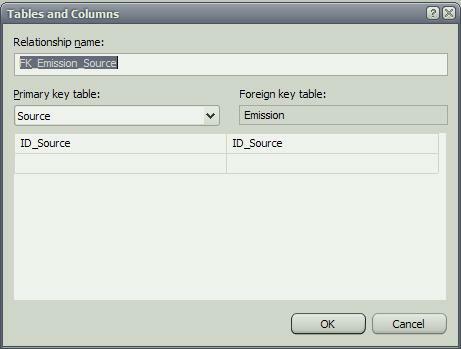 the “Foreign key table:” field specifies the name of the table (Emission) and the field in this table (ID_Source), which is the foreign key. 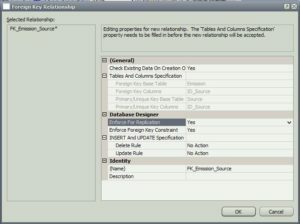 In the “Foreign Key Relationship” window, the connection properties are configured. You can leave it as it is. After creating the relationship, the diagram window will have the form shown in Figure 11. As you can see from the figure, the end of the connection (relationship) that is adjacent to the Source table has the form of a key. And the end of the connection that adjoins the Emission table has the sign of infinity. 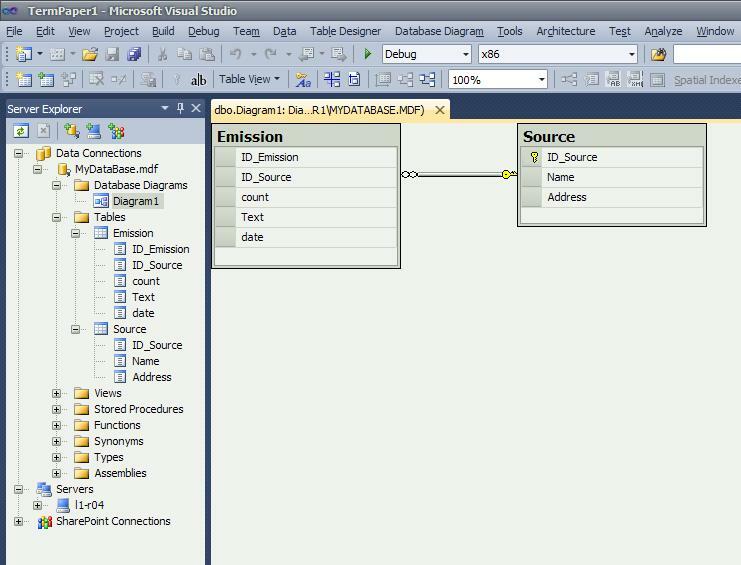 This means that in the Source table the numeric value in the ID_Source field can occur only once. And in the Emission table, the numerical value of ID_Source can be repeated (an infinite number of times). Thus, you can imagine any set of unique objects that have the property of being repeated in some subject area. 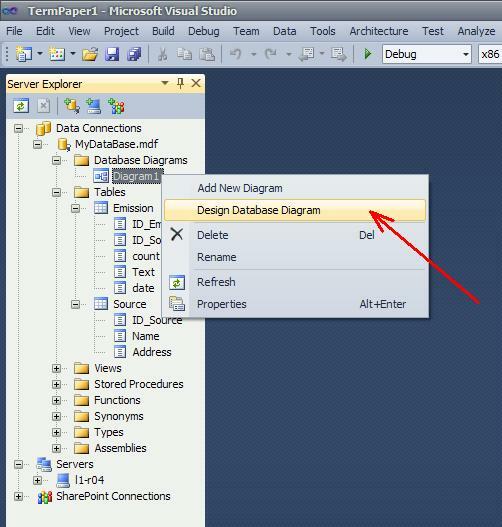 After the diagram is closed, it should be saved under a certain name, for example Diagram1 (Figure 12). The system will display the corresponding refinement window. 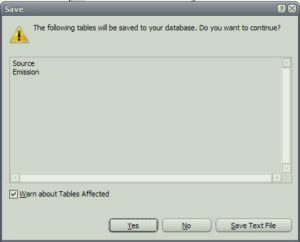 Also, the system can display a table saving window in the database (Figure 13), because there already exists a relation between the tables. In this window, you need to specify “Yes”. After the performed actions Diagram1 diagram will be displayed in the Server Explorer window (Fig. 14). 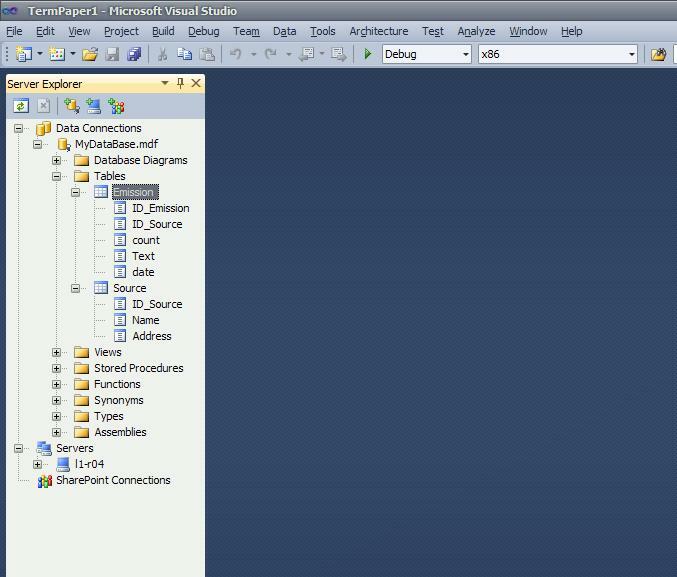 Using the commands of the context menu, you can control the diagram. 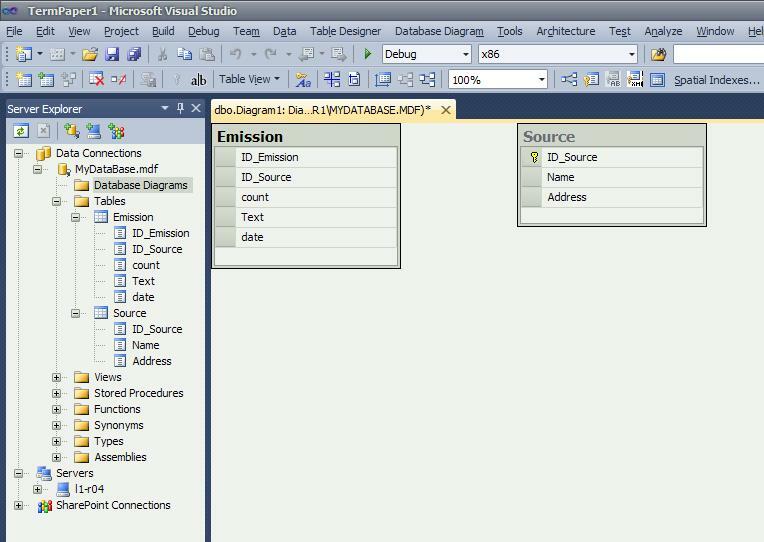 For example, the “Design Database Diagram” command takes the diagram to edit mode, where you can change the relationships between the database tables. 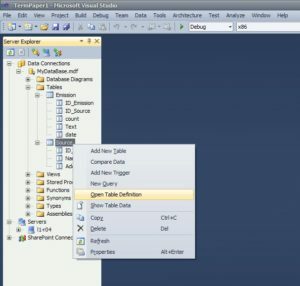 After creating a relationship between tables, you can create a project that will manage the data in the tables. But this is a completely different topic.